Louisiana Fly Fishing: Who's up for some friendly competition? In last May's Louisiana Sportsman, the Fly Lines column discussed the growing number of competitive fly fishing events. As our sport continues to grow, especially among young anglers, there's been a shift in attitudes about tournaments. The vast majority of these young anglers - like in kayak fishing - readily embrace a contest. There's several regional tournaments scheduled again this year including the Lower Mountain Fork River Foundations' "Mystery Fly" in February, Lake Athens Festival and Big Bass contest in April, "Fly Fishin For The Mission" saltwater event in April, "Bass On The Fly" at Lake Fork in May, and Rio Rodeo in October. Also, the CCA summer-long STAR tournament with speckled trout as the target species. Members of the Bayou Coast Kayak Fishing Club and Lafayette Kayak Fishing Club will again look forward to the clubs' CPR tournaments, which run from March through November. Both BCKFC and LKFC events have a fly division. Eligible species are redfish, speckled trout, and bass. The LKFC club will also have a bonus award to one non-winning angler who registers an entry in the Fly Division. Only club members can participate. Entry to the BCKFC CPR is free, while it's $5 for the LKFC CPR. Now two fly fishing clubs - New Orleans Fly Fishers Club and Kisatchie Fly Fishers - have each introduced a fly fishing contest with emphasis on variety rather than size. Basically, how many different species can a member catch on fly during the course of a year. Both are modeled after the popular "Big Year" birdwatching contest. The New Orleans club "Big Year" contest will run from March 1st and December 1st, with the most number of different species getting top prize. 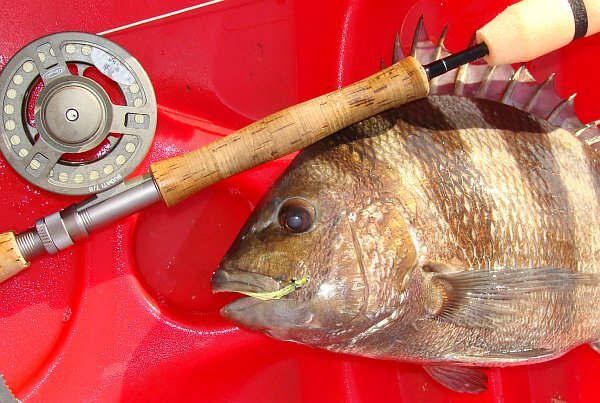 All fish must be caught within the boundaries of the FFI Gulf Coast Council. Members must submit a photo of the fish by email, along with angler name, location, species, and fly name. Each photo must include the fish, the fly, and the contest token. Contest details can be found at www.neworleansflyfishers.com. The Kisatchie Fly Fishers "Mixed Bag" tournament is also free and open to members only. KFF members will compete to see how many different species they can catch within the boundaries of the FFI Gulf Coast, Texas and Southern Councils. Unlike the NOFFC contest, members can submit their entries via an online portal. While prizes will be given to the 1st, 2nd and 3rd place finishers, the biggest prize will be drawn from all members who submitted at least one entry. Contest details will soon be up on their website at www.kisatchiefly.org. According to KFF Mixed Bag organizers Bill Morrison and Gene Taylor, the purpose of the contest is not just to have fun, but to give members who rarely can attend meetings a chance to be active in the club. Also, to give the club a database by which to show the variety of fish that can be caught on fly, and what flies work for each species.